In the most recent Argyle Tender for 2016 Lot 1 and Lot 2 were both Blue/Violet Diamonds. This means that the best diamonds – the heroes of the year – were Blue/Violet Diamonds. Lot No 1 was a 2.83 ct Oval named The Argyle Violet Colour graded BL3 and Lot no 2 was a 1.11 ct Pear Named Argyle Ultra also colour graded BL3. To give you an idea on just how rare these particular coloured diamonds are, for every 25 million carats of rough diamonds unearthed from the mine, a single polished blue or violet tender stone is produced. And in the more than 30 years of the Argyle Pink Diamonds Tender, just 12 carats of polished violet diamonds has been offered. That is extraordinary to think that so few of these naturally occurring diamonds are out there. 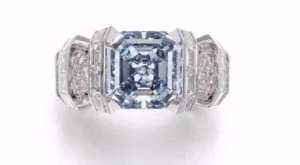 In the last week at an Auction in Sotheby’s an 8.01 ct Square step cut blue diamond known as the Sky Blue Diamond was offered. It sold and received a price of $17.1million which was up from its 2012 selling price of $12.8 million. The price for these diamonds – as they are so rare – is basically what someone is willing to pay for them. Diamonds of Australia have recently purchased an Argyle Origin Blue Diamond also graded BL3. It is a 0.45 ct Oval and it is spectacular. This blue diamond is one that we will not see again – it’s the kind of diamond that gets us very excited to add to our stock. This is in addition to a 0.25 Round Brilliant Cut Fancy Blue Grey Diamond that we have, also Certified from the Argyle mine. If you would like to arrange a personal viewing of either of these diamonds, the only way to do so is through one of our Diamonds of Australia stockists.